If you can’t dress in pink, don’t even think! No, actually see, my fairy godmother sent me a message from her iWand saying how the all the princesses she knew and fairies were starting to gossip and get a little well, let me put this in the nicest way possible – girl angry with me – since they had a problem with all the recipes that had been posted so far. But here is what I did. I just made a recipe which would surely pacify them. Sorry, I made two recipes which would pacify them. Honestly, I did not want any cat fights or claws or hair wrenching coming within 10km of my personal bubble! No big blogs of brown, no fudgy or slightly thick pudding like texture today. And no spoons required! Dainty, delicate and pretty! Fit for the [overly girly] queen! Finally, now that they’ve left me alone, let’s talk recipe! 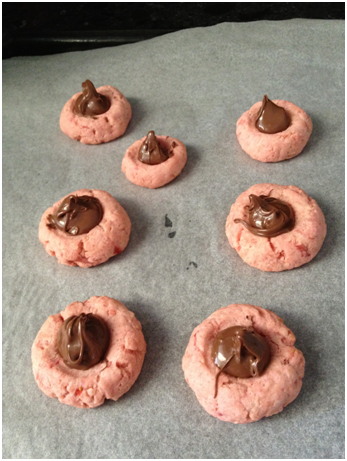 First these gorgeous Strawberry Nutella Thumbprint Cookies. From the delightfully Sinfully Spicy, these cookies are small, cute, utterly delicious and very pink (obviously). They have a melt in your mouth texture and when that first hit of Nutella reaches you, it feels like Nutella dipped strawberries all over again! The simple syrup made to be poured into your milk means I didn’t exactly have a range of options to change. 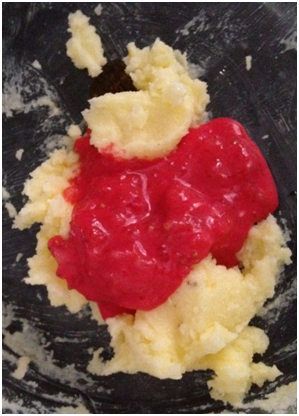 All I did was add a touch of strawberry essence – seriously, do you think I am addicted? These cookies went perfectly with the Nutella – definitely urge you try them! These are so cute & i loved the pink colour too! 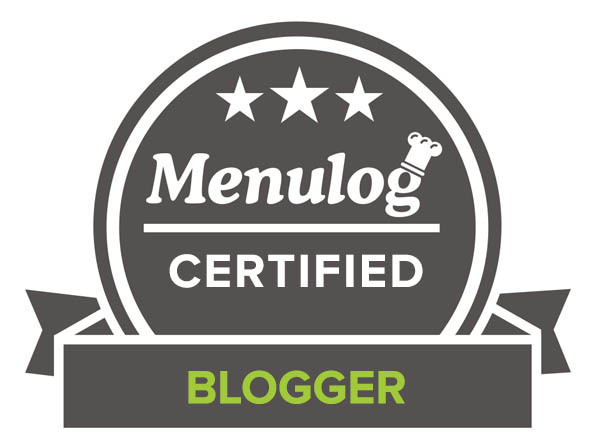 Great post & thanks for linking ! I thought about you and all of the nutella deliciousness as I used nutella for a cake filling. Oh My Goodness! These thumbprints are to die for! I am laughing so hard right now. Great post (and great blasts from the past from “Barbie Girl” to “Pretty in Pink”). Fantastic looking cookies! I am saving the recipe for V-Day. Smiling and then enjoying the food makes it so much tastier!!! 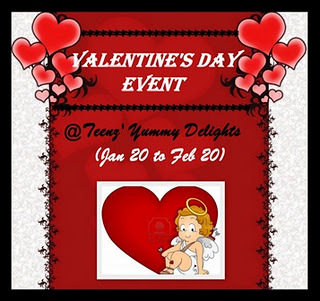 Let me know how the cookies turn out for V-Day 🙂 – I am sure you will love them! Thanks 😀 – It brought out my inner barbie as well! Glad you stopped by to enjoy this post! I love pink! 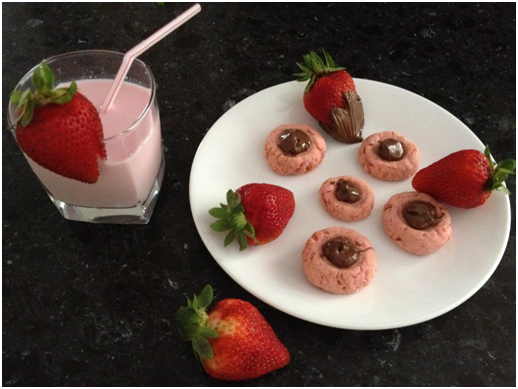 Those sweet little thumbprint cookies are calling out to me ..
Homemade strawberry milk! I am so sick of buying the artificial pink powder for my children. Bless you!! Yes yes yes to all of this! 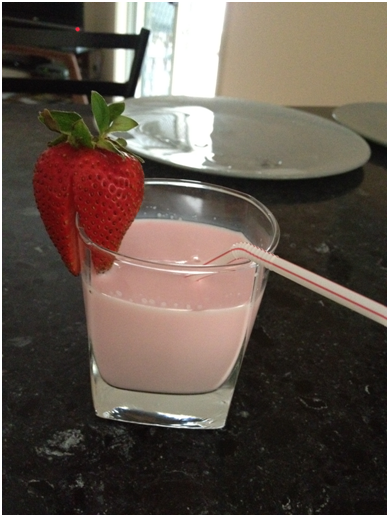 I didn’t even know you could make homemade strawberry milk. 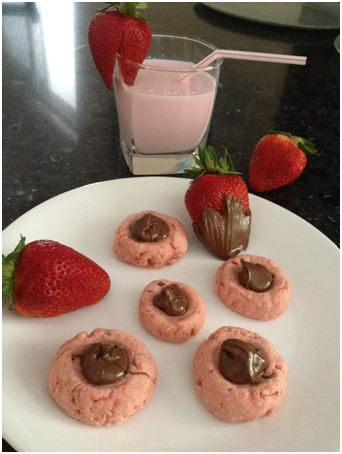 And the combo of strawberry and Nutella in those cookies? Yum! I am glad you totally enjoyed this post!!! And trust me, if there is anything irresistably, it is strawberries used as the spoon into Nutella! Strawberry Milk is definitely a throwback to when I was 10 – we lived off the Nesquick Stuff….so bad I know- your version actually is made with rela strawberries, love it! You have a lot of tasty links here, but the nutella thumbprints are the best in my opinion! Glad you pulled these out right before Valentines-they are perfect. I had to save that recipe -yum! The strawberry drink looks refreshing, I will need to try that also. Great post! Have a wonderful weekend! Aww thank you – I rather favoured them too because of the gorgeous colouring! If you make them, definitely let me know – I would love to know your thoughts! Among all that I see in the pics, that strawberry drink is what I want. Its a perfect way of starting the day, packed with energy.